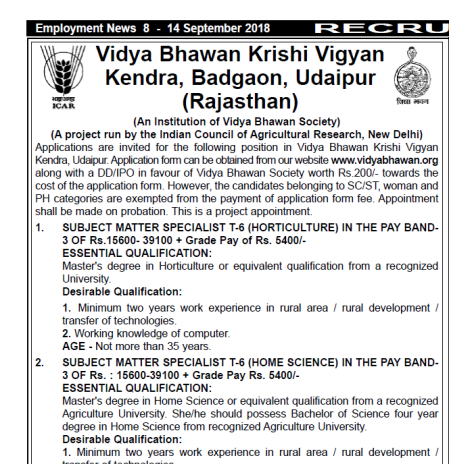 Krishi Vigyan Kendra Recruitment 2018: Stenographer Grade III, Subject Matter Specialist – The desk of Secretary, Staff Selection Committee, Vidya Bhawan Krishi Vigyan Kendra, Badgaon, Udaipur Rajasthan has released an official job vacancy recruitment notification for vacant posts of Skilled Support Staff, Stenographer Grade III, Subject Matter Specialist T-6 (Agronomy), Subject Matter Specialist T-6 (Home Science), Subject Matter Specialist T-6 (Horticulture). Application Form filling procedure under this recruitment is totally offline. 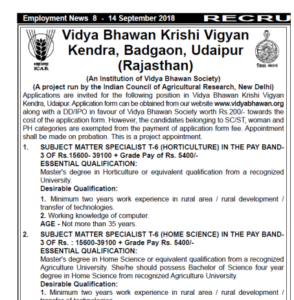 Thus, Online Registration using website link is not allowed under this Krishi Seva Kendra Recruitment 2018. The exact address where already filled Application Form along with documents required should be sent to is Vidya Bhawan Society, Dr Mohan Sinha Mehta Marg, Fatehpura, Udaipur. Now there must be some last date to submit the eligible candidate application form. And, in accordance with recently released EN 23/39 Vacancy Notification Recruitment, one month from the date of advertisement/ publication, Application Forms can be submitted. Similarly, it is minimum 18 years and maximum 27 years for Stenographer Grade III in the pay band-1 of Rs. 5200-20200 + Grade Pay of Rs. 2400/-. For subject matter specialist (Agronomy), the candidate should not be more than 35 years and will lie in the pay band 3 of Rs. 15600-39100 + Grade Pay of Rs. 5400/-. Similarly, age limit and pay band are same for Subject Matter Specialist of Home Science and Horticulture.